The barn hose: One of the banes of my existence. While I love almost all aspects of farm-handing – sprinkling corn for the hens and scratching piggies' backs and hauling bales of hay for the cows – and there's one thing I loathe. I would rather pick 1,000 manure-filled stalls, tromp through 1,000 cow-paddy laden fields or wrangle 1,000 wayward pigs than have to deal with the stupid hose. For one, it's the longest hose in the world (OK, I have no proof to back this up, but it has to be among the longest. 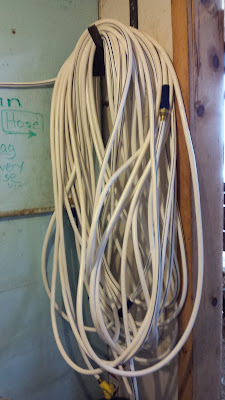 Definitely, among the top 10 long white barn hoses. OK, top 10 long white barn hoses in Pennsylvania.) Unraveling it in such a way that it's not tangled or kinked requires precision and patience. Two areas I'm obviously lacking in. I want to simply haul out the giant hose coil, toss it on the ground and drag it bucket to bucket and trough to trough with nary a knot to fuss with. 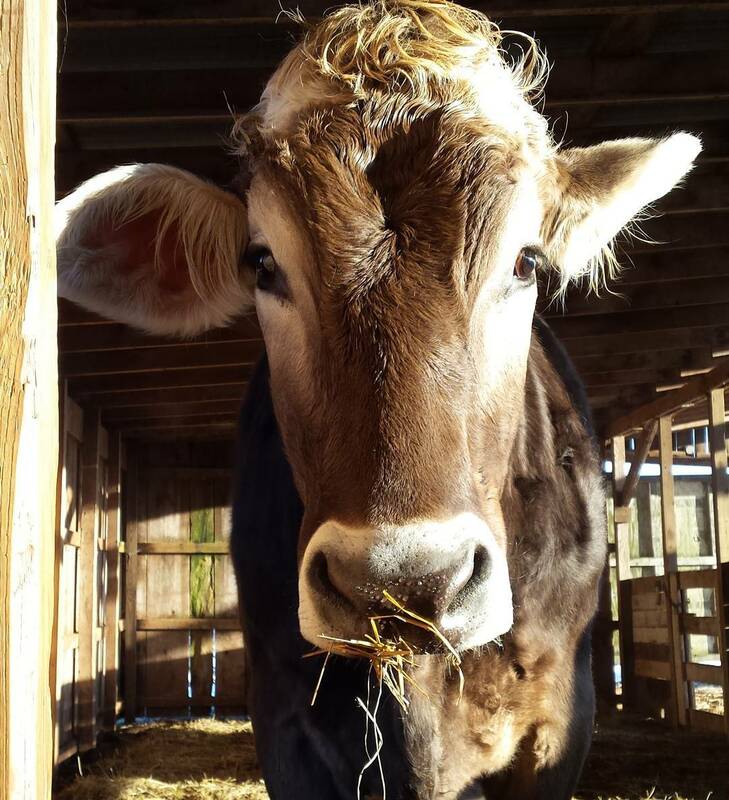 The problem is, when you just toss the giant hose coil on the dirt, straw and poo-covered barn aisle, and drag it around you not only tend to accumulate lots of dirt, straw and poo in the hose, you also tend to get a lot of knots. Not to mention there's so much resistance on the hose it feels like you're trying to drag a ravenous brown swiss away from a pile of alfalfa. 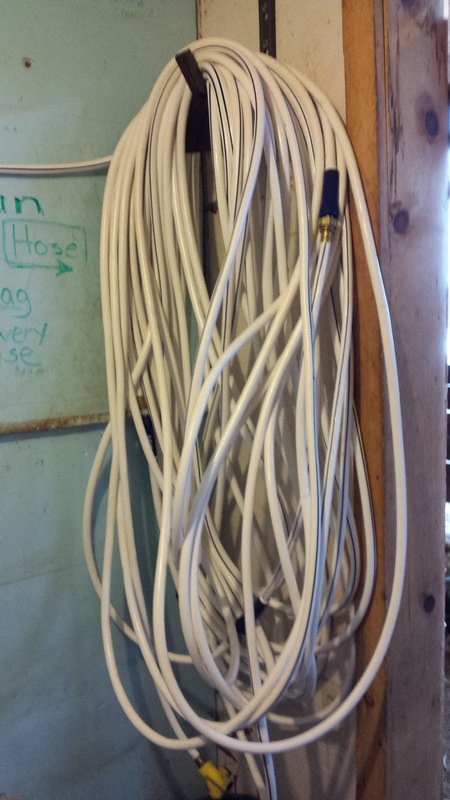 And then after hauling it all over the barn, you have to return the longest hose in the world (or at least one of the top 10 longest white barn hoses in Pennsylvania) back to its hose holder. And because it's now covered in dirt, straw and poo, you also have to clean it. And you have to do it in front of an audience. I feel like this hose is trying to teach me a lesson. That I'm supposed to be learning something about myself or about life by fighting with it every week. Probably it has something to do with not rushing for quick results and the value of methodical unwinding. I'm still trying to work it all out. Recently, it was brought to my attention that I like to find the meaning in everything. That I can't just let things be what they are, I have to excavate the thing or occurence and extract some significance from it. It's either that or that thing becomes a metaphor for something else. I do a lot of metaphoring, too. I was a little embarrassed to get this feedback. I've never wanted to sound like a know-it-all. Because I absolutely do not know it all. Or nearly it all. I'm more of a know a little who knows I know little. Nor do I believe all the meanings and metaphors I assign are true for the world at large, necessarily. They just feel true to me. And, as we all know, I'm an oversharer, so I overshare about it. But I find reassurance and joy, even, in considering the world around me and what it could be trying to tell me. This habit makes life feel richer, somehow. Existence is this infinite puzzle and any time I think I've figured out even one tiny piece of it, well, it makes it feel as if the journey weren't solely about survival. Even if in the end we're all just oversized fruit flies with longer lifespans. 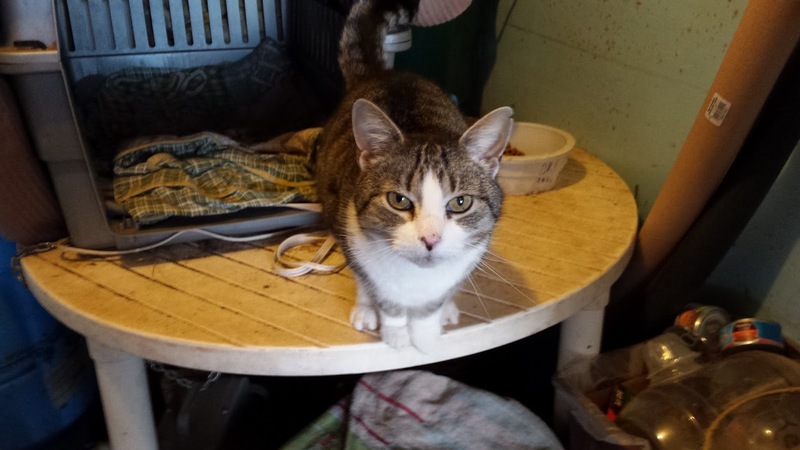 "Life can be messy, much like those stalls you muck out — and while we can long to keep everything clean, that's not what a barn is for. A barn is meant to house life... and like you said, 'all manners of excrement' come with the territory. :) It really is poignant to hear that you're entering into that tension — the pain and the beauty, the mess and the life — and it's an honor to know that our show has been a companion for that journey." What a perfect description for exploring the meaning of existence. There is a lot of tension involved. Entering it willingly is both awe-inspiring and exhausting. For each question answered, there are 10 more waiting in its place. For the record, I know the hose is just a hose. But for the purposes of self-examination, it's not just a hose. It's a good metaphor for this tension. It's useful and necessary, but also messy, frustrating and difficult to sort out when you're not deliberate and intentional about it. This is the second time the word "tension" has entered my various musings this week. I'm reading this book my dad let me borrow, "The Elegant Universe." It's basically about how the universe works (or how today's physicists suspect the universe works). I'm only a quarter of the way through it and I understand maybe one millionth of a billionth of it (I spend about as much time re-reading pages of the book as I do reading new pages). But it's really exciting when I can get even a little close to comprehending the workings of the universe at macro and micro levels. Anyway, right now, one of the most popular theories about how the universe came to be and why all the bodies in the universe from the very small to the very large behave the way they do is Superstring Theory. String Theory says that at at a sub atomic level (maybe a sub-sub-sub atomic level – I'm not really sure cuz, you know, not a physicist) but somewhere within all the atoms that make up all the things is a loop of vibrating string. And the amount of energy created by these strings is dependent on the tension of the string. More tension equals more energy. At least, I think that's what the books says. Tension is something I typically like to run away from. It's one of those words that I've always felt sounds kind of negative. I don't much like feeling tense anyway. But tension also seems associated with change. Or growth. With the explosive power of creation even. So that makes me look at tension differently. As for the hose, well. I suppose it's like a loop of string. And it creates tension in me. Beyond that, I'm not sure what to say about it. Except for that today when I was working in the barn, I let someone else put it away. Maybe not everything has some hidden meaning or message. Maybe sometimes a hose is just a hose. I don't know. I'll probably keep thinking about it though.